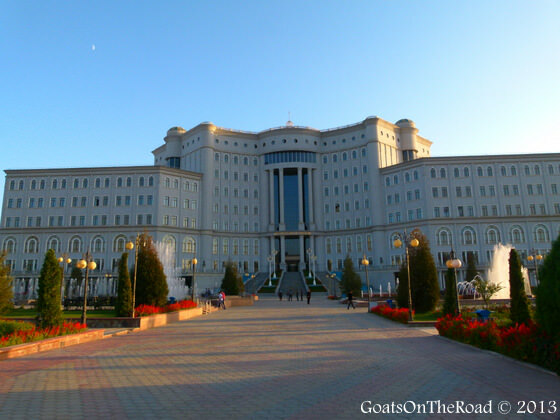 Goats on the Road Posts » Our Story » Doin’ It Up In Dushanbe, Tajikistan! After spending 2 weeks on the most amazing road trip ever, we were ready for the comforts and relaxation provided by the modern world. Goodbye mountains, hello comfy beds and delicious food! 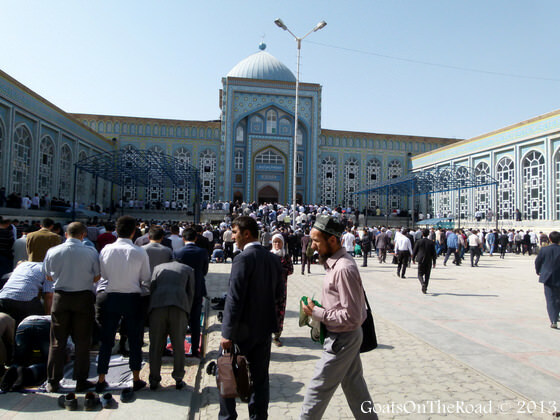 Even though we were excited to have hot showers, great food and relax, we were also in Dushanbe to try to obtain three visas for the next countries we were going to visit: Uzbekistan, Turkmenistan and Iran. 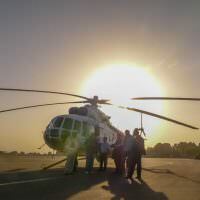 After stepping off of the helicopter (I still can’t believe we got to go on such an amazing ride), we parted ways with Jess and took a taxi to our guesthouse. When we arrived, it was around dinner time so Nick and I checked in and followed our rumbling bellies to the nearby chaikhana (teahouse) for some kebabs, bread, salad and chai. We we still so pumped up about our helicopter ride that we talked and talked very excitedly for quite a while before heading home. 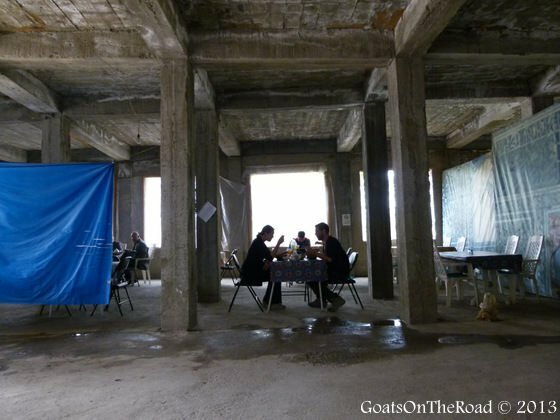 We had planned to spend about 10 days in Dushanbe arranging all of the visas and getting caught up on the website. What we didn’t plan was to actually stay in the city for the whole time! We had all of these great plans to head out into the nearby Fan Mountains and do some more trekking and possibly camping. That didn’t happen. 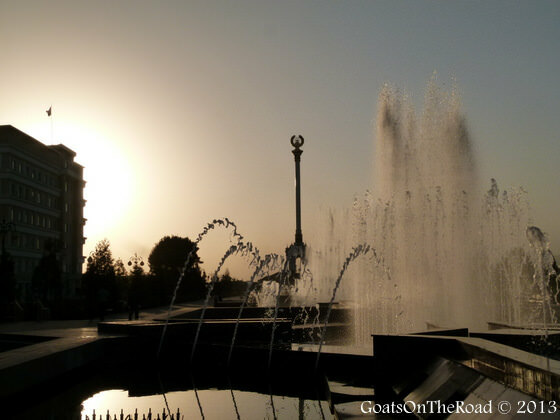 We loved Dushanbe so much and found ourselves having a little routine that was nice for a change. We awoke whenever we felt like it and walked the 3kms down the beautiful Rudaki Main Street to our favourite coffee place. We’d have two double Americanos with milk on the side and order up some fabulous brunch – pumpkin & pear soup, pastas, salmon salad, roasted vegetables and other delicious western food. The food and coffees were perfect. We then would work on the website, go and see some sights and plan what we wanted for dinner. 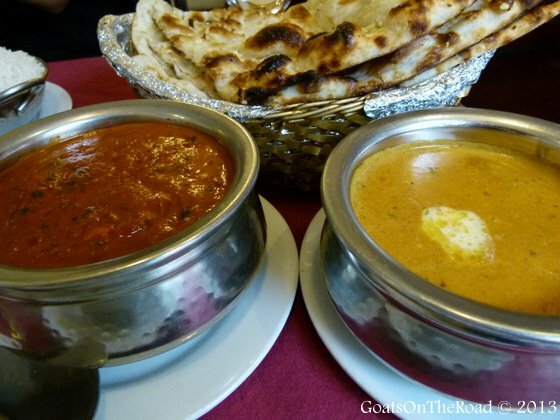 Seven out of the eleven days that we were there, we ate Indian food! As you know, we love this cuisine. We can’t get enough of it. To be completely honest, the food here was the best Indian food we’ve had – in India or outside of India. The owner is from Delhi and the chefs are from the sub-continent as well. The thick, flavourful, spicy curries hit the spot; the fluffy naan bread smothered in butter and garlic were amazing and the masala chai tea was thick and creamy. We tried something new every night and were never disappointed. mmm, some of the best curries we’ve ever had! We also ate at a nearby teahouse that we went to for lunch and snacks. We found some juicy, roasted chickens at the bazaar for dinner a couple of nights, and also discovered a great shawarma stand. 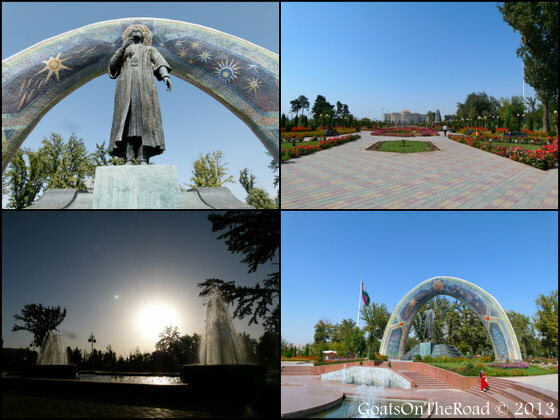 The city of Dushanbe was relaxing, quiet, beautiful and had just enough going on for us. The huge Haji Yakoub Mosque fills up on Fridays for the 1:00 call to prayer. Worshippers rolled out their own personal carpet, knelt down and prayed. It was a very interesting sight to see. Bag-i-Radaki Park was a great place to watch the sun set while kids whipped by on roller blades, parents pushed their babies in strollers and couples walked hand in hand. The flowing fountains, monuments and serene atmosphere made this a great place to linger. Near our guesthouse was the bustling Varzob Bazaar. Here we found everything we needed for our roast chicken dinner: fresh bread and every ingredient for a salad. Everyone said hello to us, were happy to have photos taken and even offered us free samples of food. 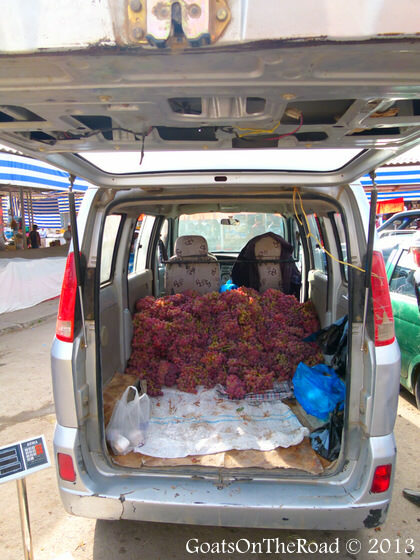 Grapes for sale…out of the back of a van! 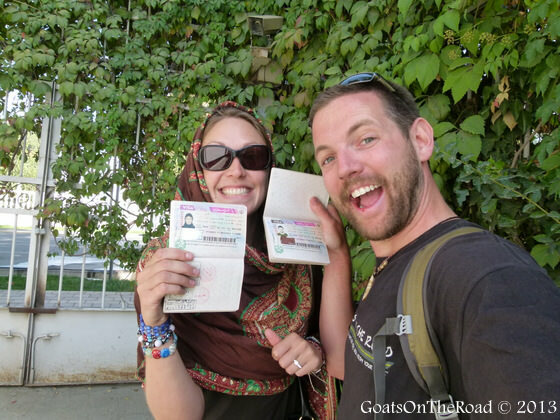 At the end of our 11 days in Dushanbe, we had successfully obtained our Iranian visa (it took 24 hours and cost 75 euros), Turkmenistan visa (it took 5 business days and cost $55) and our Uzbekistan visa (it took 2 hours and cost $75). 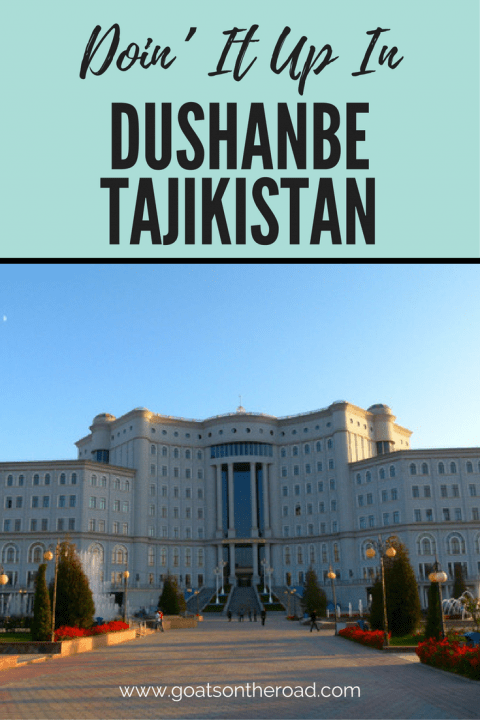 Dushanbe is the place to go if you need these visas! We had stuffed ourselves with great food, done some souvenir shopping, wandered the streets many times, got caught up on our website and enjoyed some down time. But it was now time to move on. Adventurer’s Inn. Address: Pulod Tolis 5/11 near the Varzob Bazaar. Cost: $18/person/night. We bargained and paid $15/person/night. Including wi-fi and shared bathroom. Salaam Namaste. Address: 81 Rudaki Ave. Phone: 992487018634, +992938694154. Cost: $5.80 for meat curries, $5.40 for vegetarian curries. Breads & rice $1.25-$2. They also serve beer. Segafredo Zanetti. Address: 70 Rudaki Ave. Phone: +992487015777. Cost: $1.45 for an Americano coffee. Soups $2.30-$3.10. Pastas $3.55-$6.45. Breakfast $1-$2.50. Salads $3.30-$8. Steaks, salmon, chicken meals around $10. Also check out the teahouse right at the intersection of the Varzob Bazaar for kebabs $1-$3 and salad $1.50. 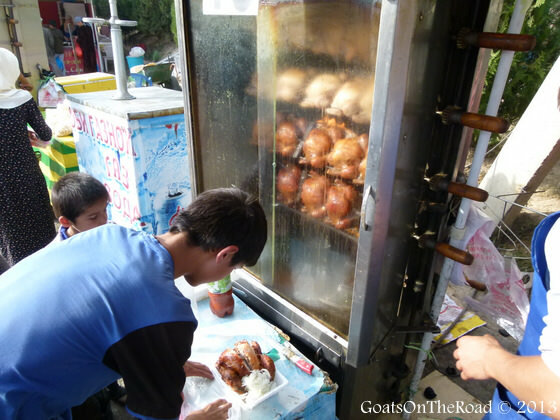 Look for the roasted chickens being sold on the street and for the small shawarma shop on Rudaki Ave.
Do you ever find yourself craving a bit of routine and western foods while on the road? Share with us below! All of that looks fantastic. My stomach is growling and I can’t go to lunch for another hour. I’m very much looking forward to your reports back from Iran. Thanks for the comment…we’ll be reporting from Iran very soon! Thanks for the warning in the title – I saved this one for *after* lunch! 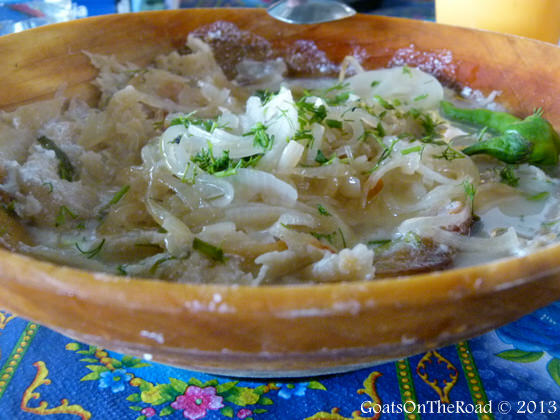 Looks like Dushanbe dished up exactly what you needed (in more ways than one.) Well done on the visas; I hear they can be quite a challenge in that region. Exciting times ahead! Oh it definitely dished up everything and more! Getting visas in this area seem daunting at first, but they’re actually quite easy to obtain…if you have the time and have a plan on where and when to get each one. Western food? Hm, not really, but I started to eat meat again when living in Kazakhstan. Two winters with -36°C and a meaty food culture made me lift my food dogma … Great trip! Enjoy the journey. Urghh! -36 degrees? That sounds like our previous life in Calgary…no fun. We loved Kazakhstan, where were you living? I would love, love, LOVE to visit Tajikistan and Central Asia. It looks so beautiful and your pictures of the food certainly do make me hungry. Got to figure out how to make that happen soon. Happy travels! Thanks Erika 🙂 Central Asia is such an interesting region. Tajikistan was one of our favourites, for sure. 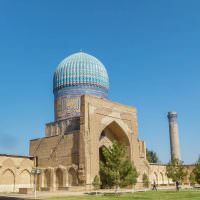 absolutely LOVING all your Central Asia posts! So happy to have stumbled upon your blog thanks to us being tribemates (Triberr ;D). I can’t wait to embark on an epic Silk Road journey…! I do have a question for you though: you guys speak Russian? I hear it is very very hard to get around this part of the world without knowing the local language or Russian. Is that true? Because it seems like you guys are getting around just fine! Or is it just sign language?! ;D haha! Isn’t Triberr great? I love meeting new people to follow as well. Nope, we don’t speak Russian…and yes, it is very difficult to get around. Honestly, I think it’s just as difficult as in China – no one speaks English in Russia or in Central Asia, except for some hotels and random people on the street. We’ve struggled at times, but do use a lot of sign language and get out the phone calculator to get across prices and numbers. We also use our language section in the back of the guidebook to help out. can’t wait to get to that Indoan restaurant! After 2 months across Iran, Turkmenistan & Uzbekistan, I have been living on bread, tomatoes & cucumbers for at least 2 weeks now… Central Asia was never goiing to be a good food option for a vegetarian! At home II cook Indian, eat out Indian, & when travelling I always sniff out the nearest Indian restaurant… my taste buds ate on overdrive thinking about Dushanbe! I totally understand, even as a meat eater, Central Asia was hard – I don’t like lamb and much of the meat is a bit “mystery” haha. I just read that you got your Uzbek visa in Dushanbe in just two hours. My question is: did you have a LOI at the time? This may be the reason why you got the visa so fast. The most recent (embassy) online info I can find says that (for those not needing a LOI like me) it can be 5 working days, and that ‘foreigners’ seem to be processed ‘last’ (after anyone else). Sounds tempting to get it on the spot in Dushanbe, but if not… it could mean a ‘wasted’ week (stuck in D.). Thx. Yes, we did have a Letter of Invitation. We dropped our passport, LOI and money off, waited outside of the embassy, then picked it up about 2 hours later. the crowds were enormous though and it was quite chaotic, but it was fast for us. been going through your trip in chronological order (it’s a terribly addictive read), but i think i missed the part where your other travel partner Jason bid his adieu. i suppose he went with you up to Khorog at least, so where did he go after having finished the Pamir Highway? to me the logical next destination would seem Dushanbe and your means of transport would be the pinnacle, but he had other plans? I’m sorry that this comment was missed – almost a year late! Hey just stumbled upon your blog and love reading about your adventures! I am planning on trip to the Stans and wondering about attire for women travelers. Did you need to cover your head or knees at all? I know the majority religion is Muslim which is more conservative so do not want to offend or stand out. I’m so sorry that this comment was missed somehow. Yes, you must dress conservatively. I wore pants the whole time, but t-shirts are OK. I didn’t wear a headscarf, but always had one with me for entering into mosques. Why would you bargain a place down from $18 to $15 per day. I guarantee the owners need the $3 more than you do. We bargained down because we stayed longterm – 11 days. If you stay more than 5 days – 1 week basically anywhere in the world, it’s normal to ask for a discount. I was living in Dushanbe around the time you wrote this and absolutely loved every second of it as well! So lively, such kind people, and such beautiful streets. I didn’t care that it was 40 degrees every day; I still walked 30m every day to and from my classes. And the bread ladies at the Varzob bazaar… I still dream of that bread!